April: John Murray applies for second water rights on Murray Creek. 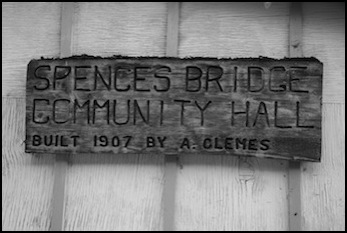 From Wikipedia: In 1892, the population of Spences Bridge included 32 people of European ancestry and 130 First Nations people. There were 5 general stores, 3 hotels, one Church of England and one school. The principal industries are fruit growing and farming. 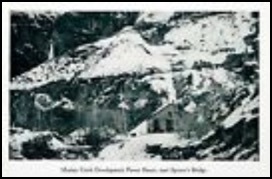 Archibald Clemes installs power plant at foot of Murray Creek Falls. Supplied electricity to hotel, both railways and citizens. 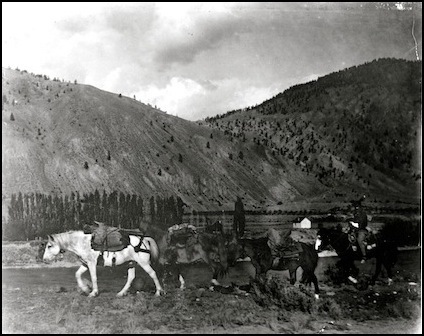 Bricklen advised he had been talking to Ashcroft municipality regarding their filtering methods -- they have a somewhat sophisticated system whereby they have stainless steel mesh pipe in the flow of the river -- different from our system where screening is in the backgetty. He suggested if it were feasible maybe we could look into an extension on our intake out stream. He ended by saying if we wished, he could try and get more information on Ashcroft system as to who engineered it and go from there. From September 1999 – September 2011 Sukh Gill was TNRD Director of Finance. Since September 2011, Gill has been TNRD Chief Administrative Officer. 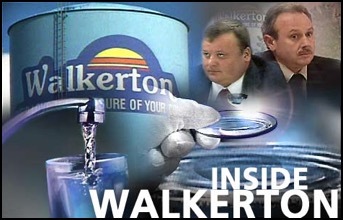 4) Wikipedia: Walkerton E. coli outbreak in Walkerton, Ontario, Canada. Objectives: focusing on TNRD managing water system. 1)	Mostly done by Civic Engineering in 1997	2)	Waterworks system is a workable system not necessarily to Kamloops standard but not required. First estimate of costs of improvements will be ball park figures. 3)	Lots of water from Murray Creek, 100,000 gallon supply. May not have to write off Murray Creek system - could use household filtration system - approximately $500.00 per house. Well - costs $200,000.00 & then maintaining -- worth investigating. Reservoir is needed. 4)	Mr. Mackinnon advised we have solid operating plan. 5)	Walter advised Cook’s Ferry Indian Band will not be expanding in Spences Bridge in the near future. 6)	May get clear water from ground water system. Section 1.6 Water System Deficiencies (p.5). Section 1.7 - Water System Improvements (p.5 -6). Section 6 - Summary & Conclusions (p.27-28). Ted advised Mr. Mayfield that SBWB is working on a new system in conjunction with CFIB and the TNRD. Ted also advised Mr. Mayfield that we are working with Brian Grossler regarding Power Plant on Murray Creek. Old business: CFIB Regional Water Supply Strategy Report and May 26 meeting. 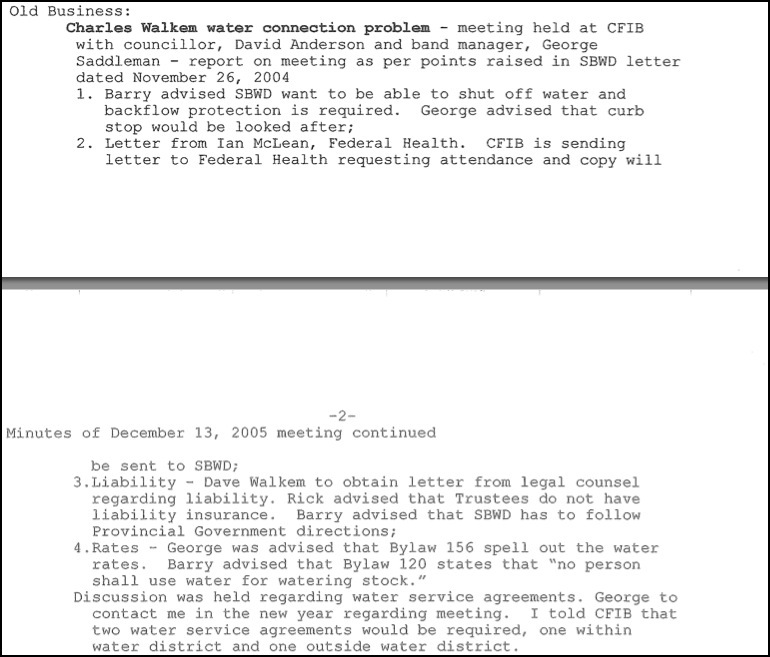 It was moved by Walter seconded by Al that SBWB trustees are prepared to proceed with a new water system as contained in Cooks Ferry Band Regional Water Supply Strategy prepared by David Nairne & Associates dated March 28, 2003 subject to TNRD obtaining infrastructure monies (1/3 federal, 1/3 provincial + 1/3 local) and subject to approval from residents in Spences Bridge. 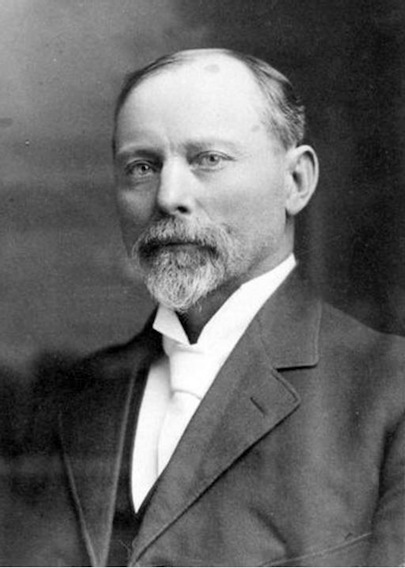 If there are insufficient grants or no grants obtainable for Spences Bridge, there is no reason for SBWD to be taken over by the TNRD and SBWD to continue as before, John Smith advised. If infrastructure grants are approved, only then, a Referendum or Petition (petition is the shorter time but includes all the taxpayers, referendum is approved by only the taxpayers present). 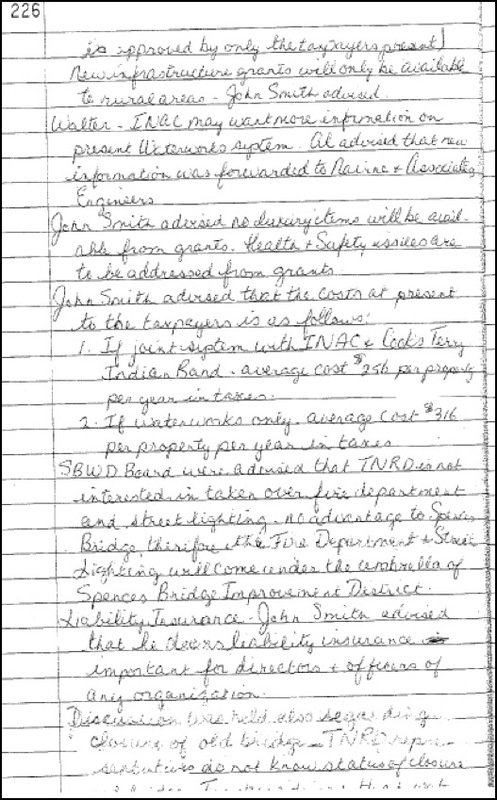 John Smith (TNRD) advised that the costs at present to the taxpayers are as follows:	1)	If joint system with INAC and Cooks Ferry Indian Band - average cost $256 per property per year in taxes.2) If water works only - average cost $316 per property per year in taxes.John Smith advised that he deems liability insurance important for directors and officers of any organization. 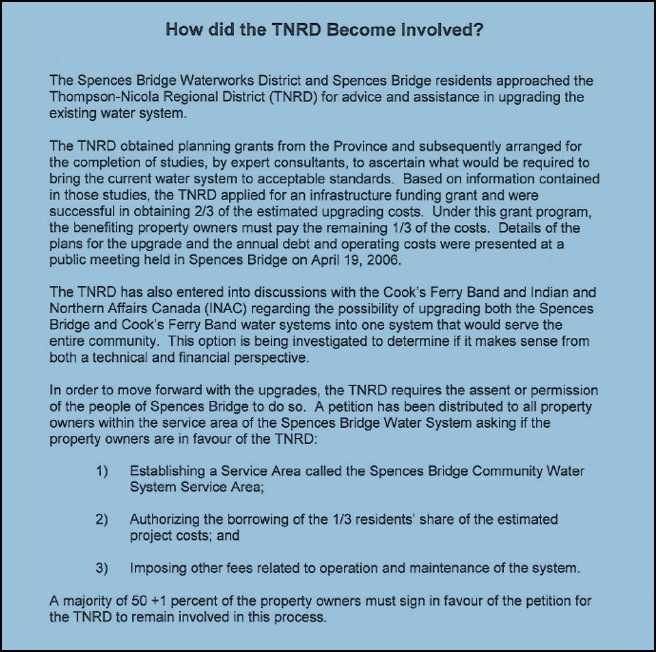 I request a copy of the presentation given to residents of Spences Bridge by the TNRD on April 15, 2004 about its possible takeover of the Spences Bridge water system. A vote was taken at that presentation. Please include all documentation related to this vote. 8) September 27, 2004, Interior Health Letter to TNRD re Infrastructure Grant for Spences Bridge Community Waterworks re Drinking Water Protection Act. TNRD Grant application to B.C.Community Water Improvement Program. 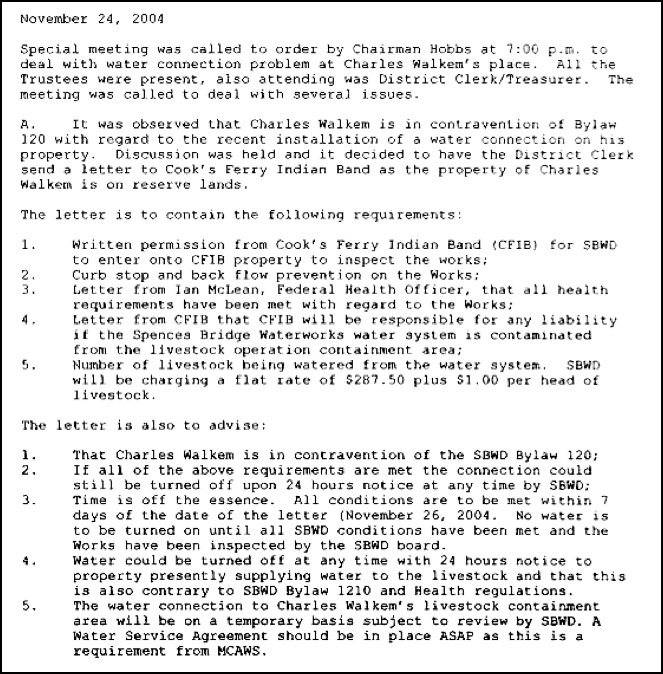 2) April 4, 2006 - DOCUMENT LINK: Notes on meeting held at Cook’s Ferry Indian Band Office re SB Water System. Read PDF version of the document here. 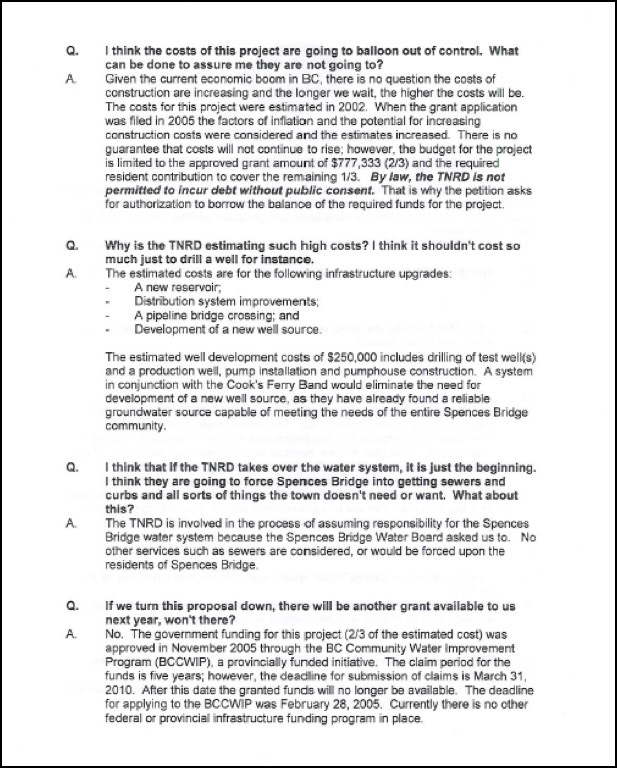 3) April 19, 2006: DOCUMENT LINK - Presentation given by TNRD staff to Spences Bridge residents. Editor’s note: AWAITING FOI REQUEST FOR COPY OF POWERPOINT PRESENTATION GIVEN TO CITIZENS. 5) May 9, 2006: PETITION PACKAGE sent to landowners by TNRD. : Borrowing of $400,000 for capital upgrades eventually given assent by 75 of 120 landowners. Bylaw 2088. PETITION PACKAGE MAP. 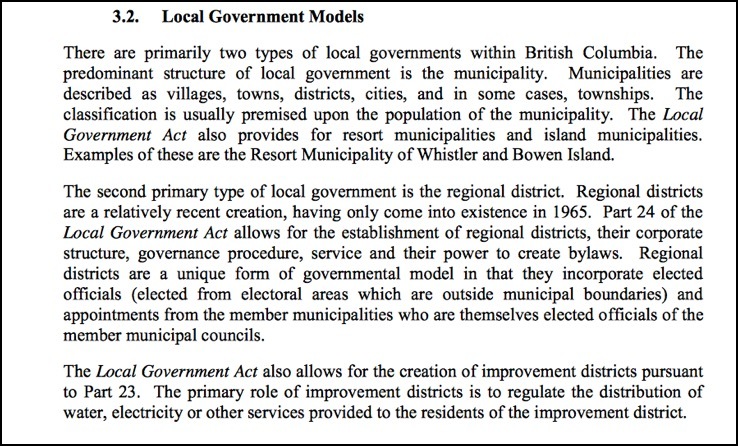 A Bylaw to Establish a Community Water System Within a Portion of Electoral Area “I” (Blue Sky Country). Read PDF version of the document here. 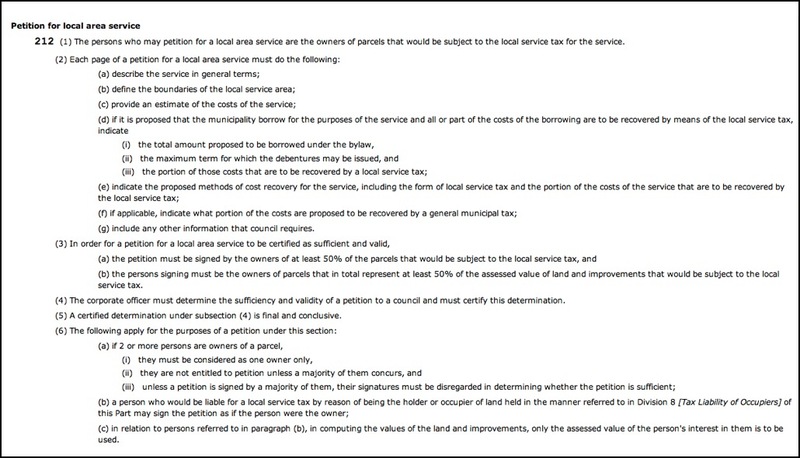 Editor’s note: Map accompanying Bylaw does not include IR1. Greetings, As my editorial has been passed around and I have been asked to produce the minutes of the meeting I mentioned in the article by a couple locals..(a meeting on April 8th, 2008. 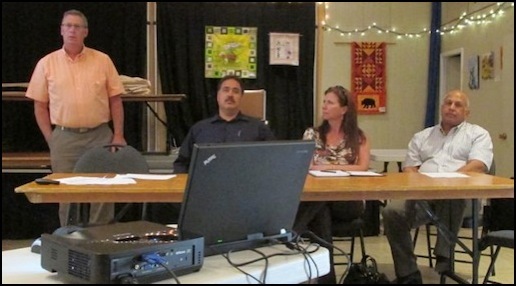 A meeting that was one of many where it was made clear that Murray Creek was not an option as I stated in my editorial.) For those of you who moved here after 2008 you may be interested in some of the public meetings that were held, (I went to them all as did many others) what was discussed and what decisions resulted. The decision to have our current water system and have it funded through grants and taxes was made by the people who lived in Spences Bridge at the time...no one else. Attached are the minutes of the meeting mentioned in my article. Editor’s note: Director Rice’s July 23, 2015 article/editorial is included below under Yr. 2015 - item 9. 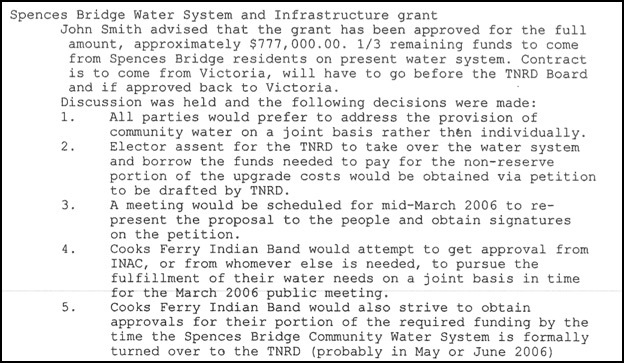 2) April 8, 2008: TNRD POWERPOINT PRESENTATION GIVEN TO SPENCES BRIDGE CITIZENS. 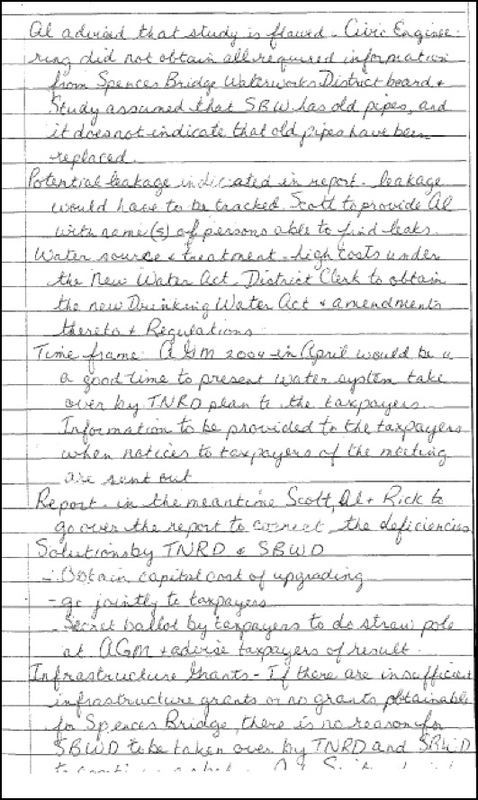 3) April 24, 2008: PETITION PACKAGE : Borrowing of $800,000 over 20 years for purpose of groundwater sourcing, reservoir and distribution system improvements. Bylaw #2227. PETITION PACKAGE MAP. 1) Building of new SB Water System reservoir completed. 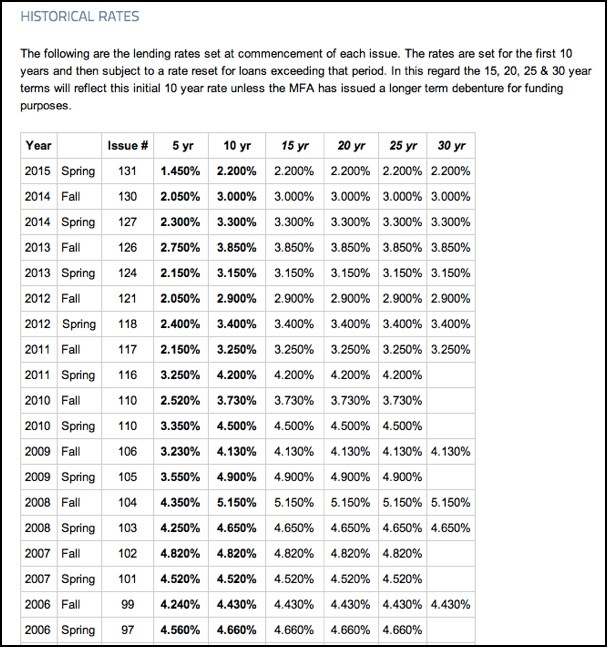 2) DOCUMENT LINK: April 3, 2009 (Official approval date). Statement as to the Sufficiency of a Petition for Spences Bridge community to borrow $800,000 here. 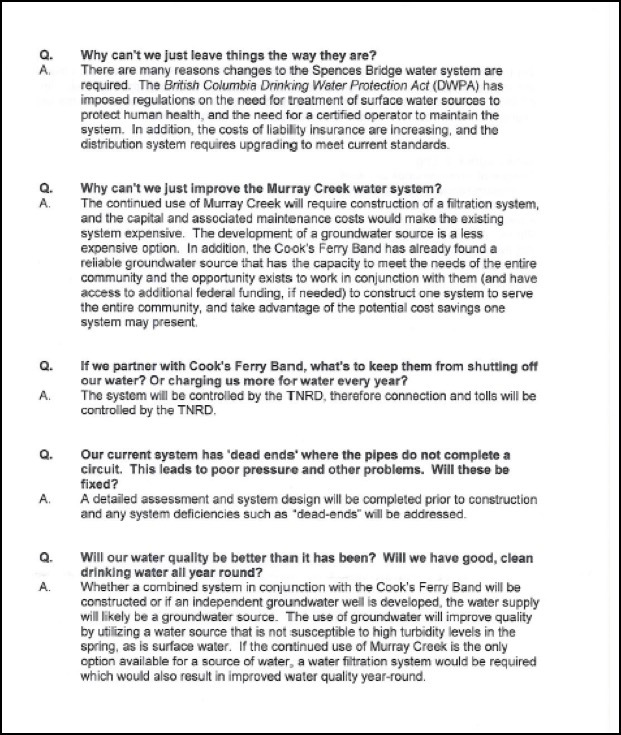 3) DOCUMENT LINK: April 7, 2009 Estimated cost ($4,205,000) for the joint water system and allocation of the costs. TNRD Public Notice here. 4) DOCUMENT LINK: September 15, 2009. 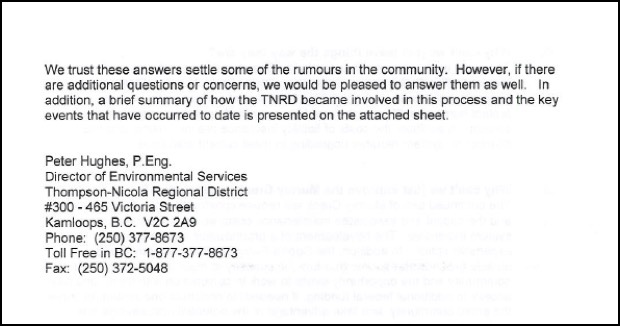 Report from TNRD Director of Environmental Services dated September 15, 2009 re Contract Award, Spences Bridge Community Water System Contract “B” - TCH No.1 Bridge water Main here. 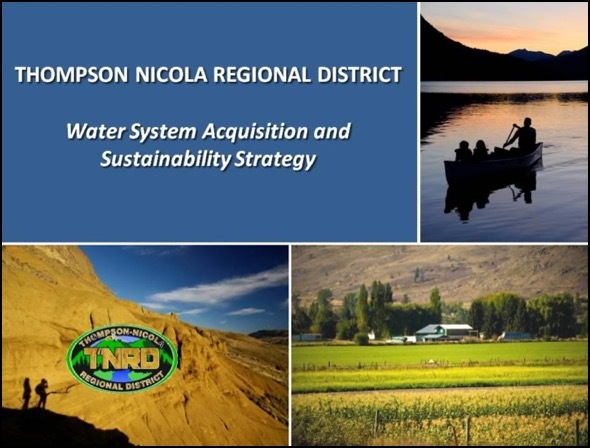 5) DOCUMENT LINK: TNRD Water System Acquisition and Sustainability Strategy created by Urban Systems. 1) January: Municipal Type Service Agreement TNRD -Cook’s Ferry Indian Band Joint-Owned Water System (DRAFT) shows estimated project cost of $3,082,257. 2) DOCUMENT LINK: August 15, 2012 Municipal Type Service Agreement TNRD -Cook’s Ferry Indian Band Joint-Owned Water System. Editor’s note: AWAITING FOI REQUEST FOR COPY OF AGREEMENT. 3) DOCUMENT LINK: Provincial Government Design Guidelines for Rural Residential Community Water Systems. 4) April 2012 - March 2013. Water and Wastewater Infrastructure Investment Report from Development Canada re Cook’s Ferry. 5) October 15 & 16, 2012 BC Water & Waste Association hosts a Small Water Systems (SWS) Mini-Conference in Kamloops, BC. Related PowerPoint Presentation to above Conference delivered in Spences Bridge titled “Once Upon a Time”: COOKS FERRY INDIAN BAND/SPENCES BRIDGE SUCCESSFUL PARTNERSHIP by Gerson Neiva. 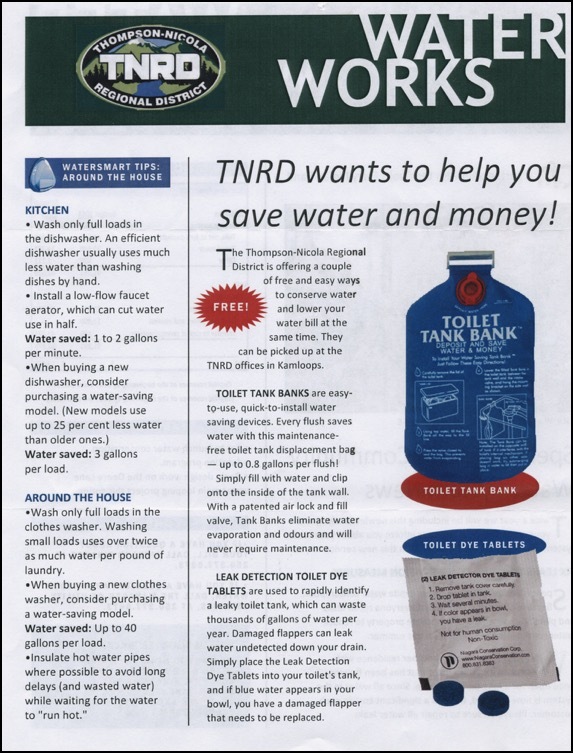 1) May, 2013 : Water Conservation Tips for TNRD Residents SPENCES BRIDGE. 2) YOUTUBE VIDEO LINK: July 9, 2013. CFIB-TNRD Spences Bridge Water System Information Meeting. 1) December 31, 2014. 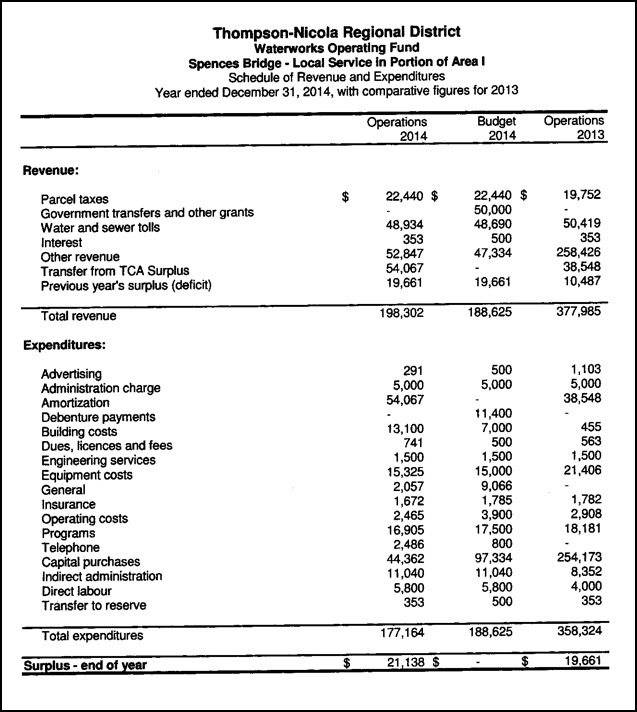 DOCUMENT: Spences Bridge Waterworks Operating Fund Schedule of Revenue and Expenditures. 2014 TNRD remuneration: $24,805.25 plus expenses of $12, 095.03. 2014 TNRD remuneration: $212,963.93 plus expenses of $15,542.68. 2014 TNRD remuneration: $141,356.58 plus expenses of $2,465.68. 1) APRIL 2, 2015: TNRD LETTER TO ALL LANDOWNERS RE Spences Bridge Water Service - Loan Authorization/Parcel Tax Commutation Process. 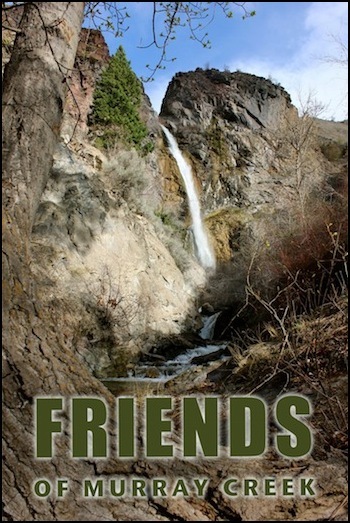 4) APRIL 21, 2015: FRIENDS OF MURRAY CREEK. 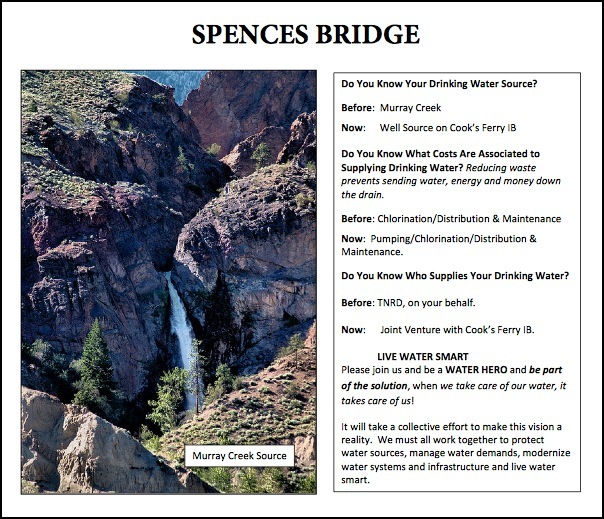 An informal group of Spences Bridge citizens begins researching and discussing all aspects of the Spences Bridge Water System. Approximately 45 people attended the first meeting called by Laurie Kingston. 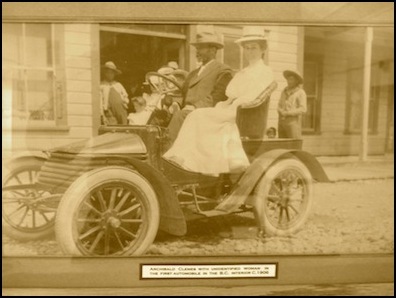 A number of subsequent meetings have been held, also at Clemes Hall. 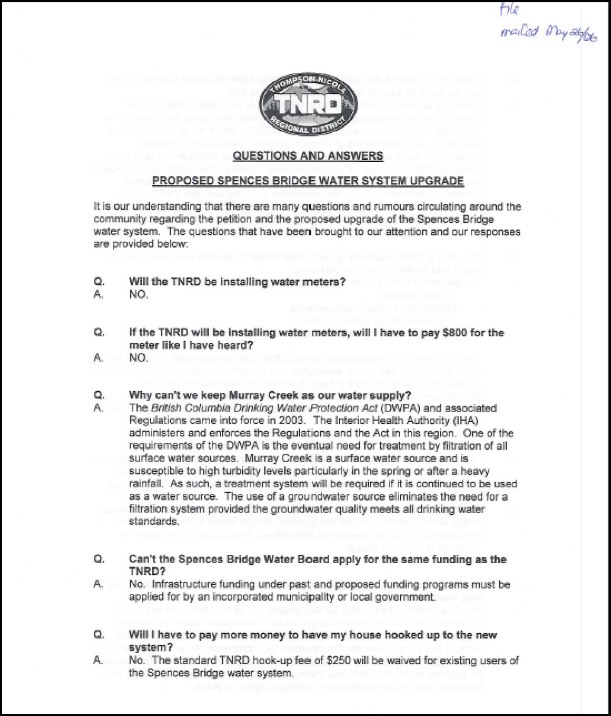 5) June 10, 2015 TNRD presentation in Spences Bridge re water system rate increase. Listen to the complete audio recording of this well-attended 1 hour meeting here. 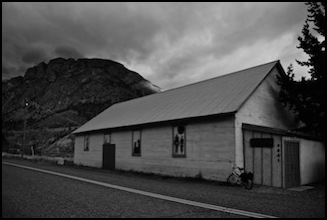 CP Rail waterworks access shed. At your recent presentation here in SB you referred to a 2.5 million dollar treatment plant option to the existing SB water system. I am interested in reviewing any documentation the TNRD has with regard to that option. Please advise me as to what is available in this regard. On 2015-06-24 09:29, Peter Hughes wrote: There is no documentation. It is an estimate based on other typical treatment plant projects. 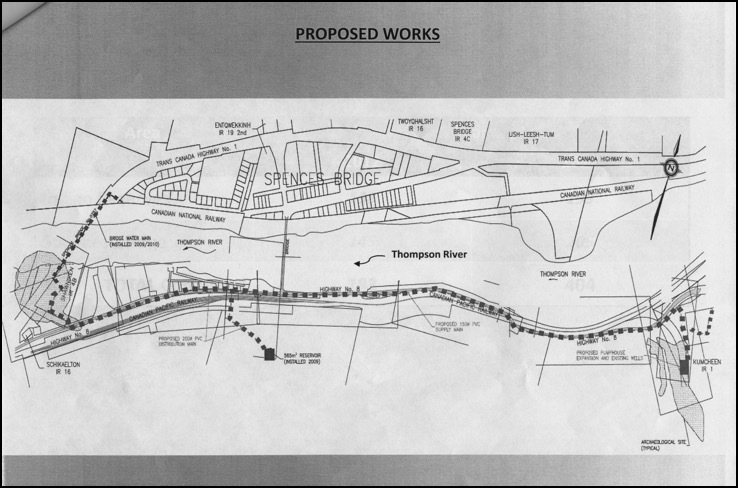 To build a new treatment system to handle the poor water quality in Murray Creek during a portion of the year (or the Thompson for that matter) would be would be in the $1.5M to $2.5M range. That is a guestimate. As an example, the Village of Clinton recently build a surface water treatment plant for about $2M. That was for a surface water source that has better water quality than Murray Creek. A conservative estimate to build a new treatment system to handle the seasonally poor water quality in Murray Creek (or the Thompson River for that matter) would be would be in the $1.5M to $2.5M range. A better estimate would require some further investigation into seasonal water quality, sediment size, etc. 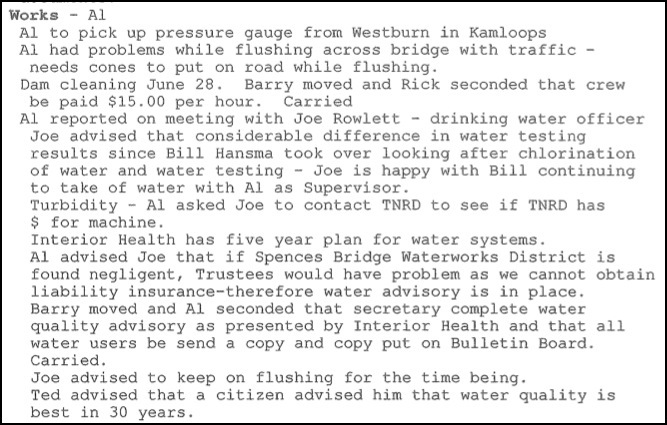 7) June 30, 2015: ARDEN BOLTON, TNRD Weighs in on Spences Bridge Water System re Fire Protection. Short answer: Yes, the current system has fire protection flows and exceeds basic requirements for flow and duration. There are many different fire protection standards, and the first question that you should ask is which one are you trying to meet? Fire protection is a combination of several factors: Required flow based on structures, Reservoir size for flow duration, Distribution system capability, Fire hydrant and lead flow capability etc.. The most basic standard for residential housing is 60 l/sec for 2 hours. Many standards go on to say, for Example: that you have to include a 25% reserve capacity + 25% of MDD and it can’t include the pumps continuing to supply water to the reservoir during use Etc... Etc… there are also many different fire flows recommended for different housing densities, commercial and industrial businesses etc… the bottom line: there are many variations. 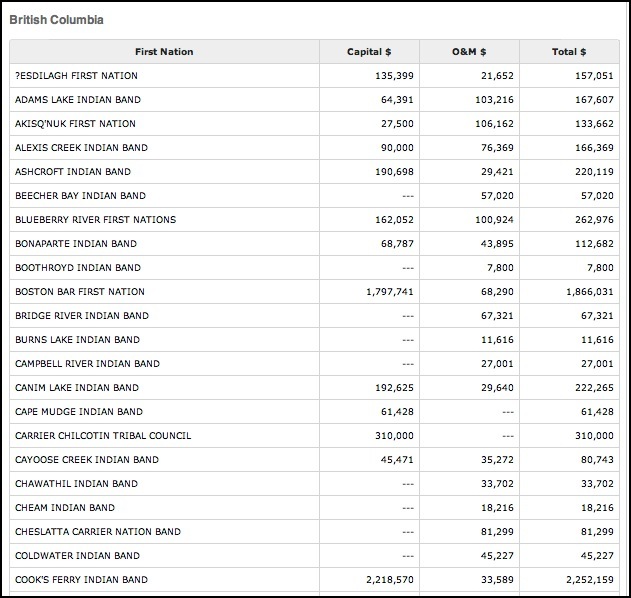 Because this system was designed with the 1st Nations included, a federal standard was applied initially (FUS/IAO). This standard recommended (key word) a fire flow of 100l/sec for the community. Arnie Oram, Fire Chief is actually quoted in the documentation as saying that the fire truck is only capable of pumping 80 l/sec. (Please see the included scanned design notes). Obviously having a higher flow capacity would be pointless if the fire truck could not utilize it. They willingly allowed the system to meet an 80 l/sec for 2 hours design. This is still sufficient and exceeds the basic standard for average density residential housing of 60 l/sec. 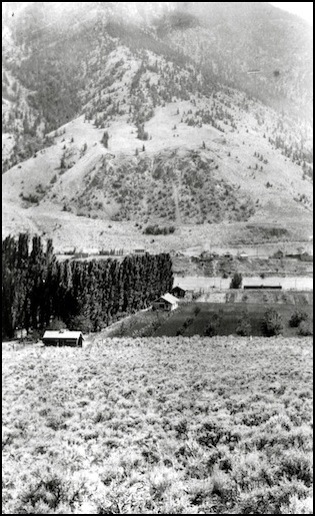 The previous system was almost completely dependent on continuous water flow from Murray creek. There was only a 2” line across the old bridge so essentially there was no fire protection on the south shore. There was a 75 cubic meter firefighting reservoir added to the south side for emergency use only. 75 cubic meters would provide 20 minutes of firefighting at 60 l/second. 20 minutes is a long way from the 2 hours required. Also, that water would have immediately contaminated the drinking water system if it had been used. Fire flows from Murray creek would have been variable with the season, however, it would not have met any standards as most require that the supply water not be included and that the calculations are only from the reservoir. There was no reservoir. In this equation, there was NO fire protection in Spences Bridge before. Also, there was no filtration at all, any debris in the water could plug nozzles at any time. High fire flows would have compounded this problem. The current system has a new 565m3 reservoir (see drawing below), new larger distribution mains connecting both sides of town, a clean water source and maintains an emergency backup connection to Murray Creek. The new reservoir was designed to meet the fire flows of the fire truck and will supply: 80 l/s for 2 hours OR 60 l/s for 2.5 hours. This exceeds the basic requirements mentioned above. Also, if you want to include pump flows in the calculations, the pumps flow 16 l/s. with the pumps running you could flow 60l/s for 3.5 hours. The new system does not have Murray creek variability, instability, debris flows, and all the other problems you know to exist there. While the back bone (water main) of the system has been improved across the river, there are still many distribution problems due to the 4” lines. Generally speaking, long runs of 4” lines cannot flow enough water for modern fire protection requirements. In fact if you run your fire truck at 80 l/s in some areas of town with 4” lines, you run the risk of damaging the water system or your truck. It’s safe to assume that all old fire hydrants with 4” leads also will not meet modern fire flow requirements. This is one of the remaining issues that needs to be resolved. The TNRD is installing looping this year that will also improve fire flows in the distribution system. The new system does have “fire protection” and exceeds basic requirements for flow and duration (it can flow 60l/s for 2.5 hours), it protects both sides of the river, it is substantially better than it used to be, it has an emergency backup source and our planned looping will improve fire flows in the distribution system. Please focus on fixing water leaks in your community, that is where the real problem lies. 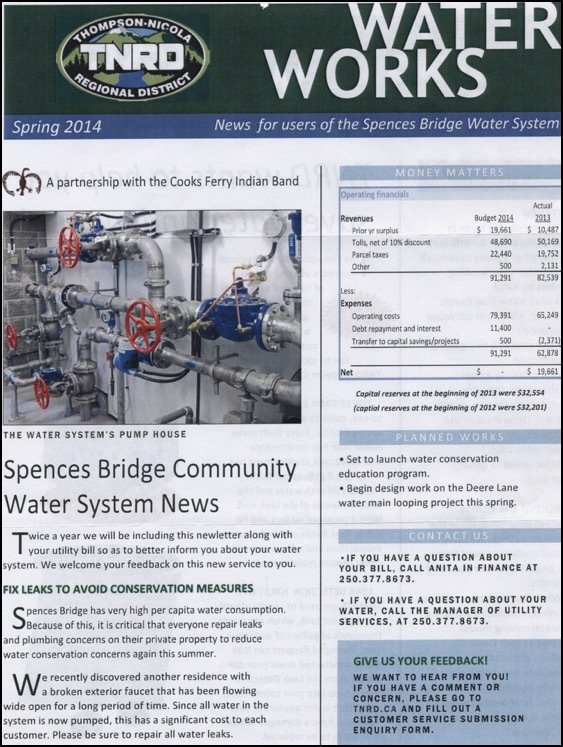 What is the total cost of the SB water system upgrade you have implemented for Spences Bridge? The TNRD (i.e. 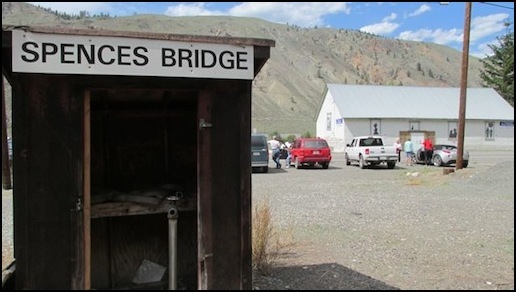 Spences Bridge) portion is $777,333 (BCCWIP Grant) + $459,332 (BCF Grant) +$400,000 borrowing + $800,000 borrowing = $2,436,665. The CFIB portion of the project was estimated to be $3,000,000. For an exact number you will have to contact the CFIB. Editor’s note: $2,436,665 + $3,000,000 = $5,436,665 (Estimated). 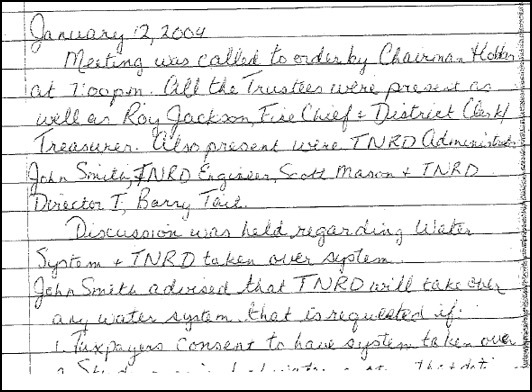 Compare with April 7, 2009 Estimated cost ($4,205,000) for the joint water system and allocation of the costs provided in TNRD Public Notice here. 10) AUGUST 14, 2015: TNRD RESPONDS TO FOI REQUEST FROM DWAYNE ROURKE REGARDING INSTALLATION OF WATER METERS IN SB. READ COMPLETE DOCUMENT PACKAGE HERE. 11) AUGUST 14, 2015: TNRD RESPONDS TO FOI REQUEST FROM MICHAEL JEFFERSON REGARDING “records related to 'contracts and invoices between the TNRD and the Canadian Pacific Railway, Canadian National Railway and Via Rail relative to their respective commercial access and use of the Spences-Bridge Improvement District domestic water supply”. READ COMPLETE DOCUMENT PACKAGE HERE. 12) AUGUST 18, 2015. Douglas Rae, TNRD Director of Finance advises against extension of deadline regarding SB Debt Commutation Process. Board of Directors Meeting Document here. August 20, 2015 meeting agenda here. 13) OCTOBER 11, 2015: TNRD to Conduct Review on Spences Bridge Water Tax. 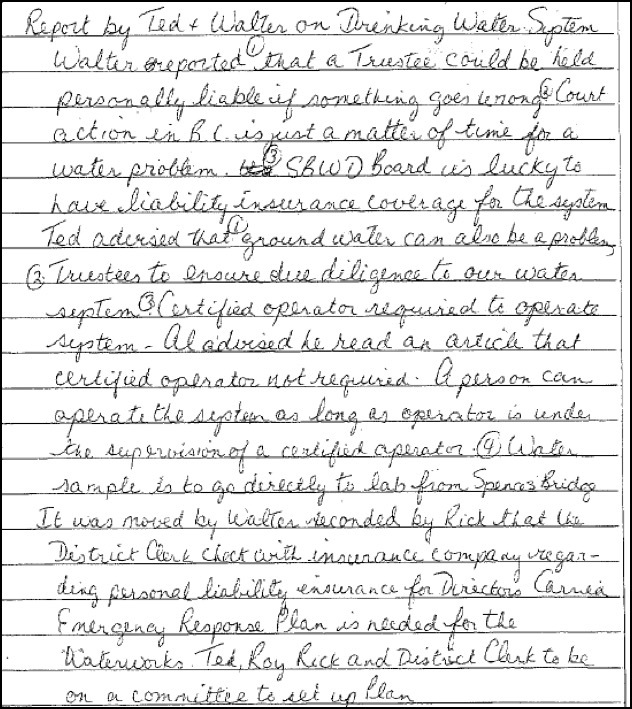 14) NOVEMBER 16, 2015:Spences Bridge landowner James Kohut addressed the TNRD Board of Directors on November 20th re 1.2 million dollar debt incurred by landowners for new water system. 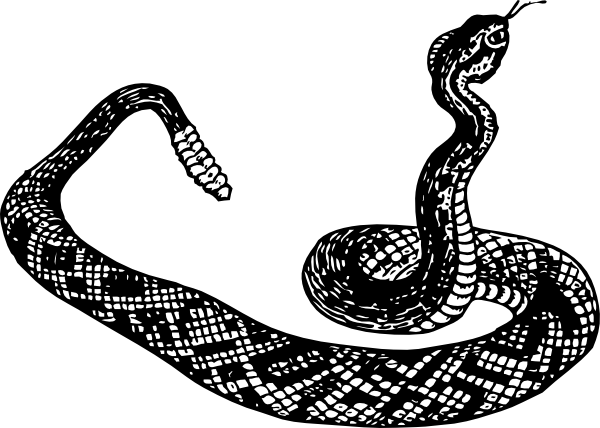 Read Kohut’s documentation here. Note: Hyperlinks within the original document are not visible but all refer to online resources located on The Rattler. 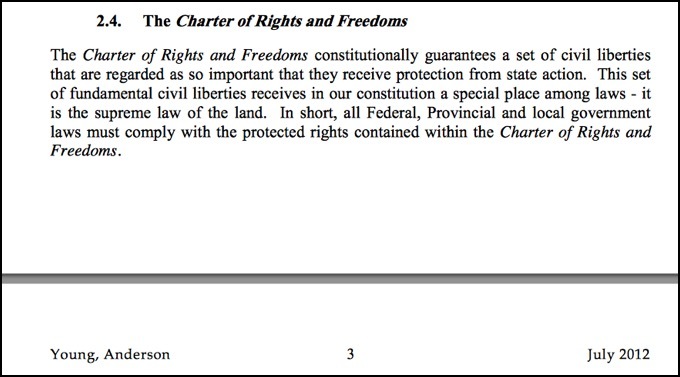 Canadian Charter of Rights and Freedoms on Wikipedia.